Basseterre, Thursday November 9, 2017 – Fourteen families were on Tuesday presented with keys to their new homes under Phase 1 of the Unity Housing Solutions Program, an initiative by the Government of St Kitts and Nevis in collaboration with the National Housing Corporation (NHC) aimed at increasing housing capacity on the island of St Kitts. Speaking during the key presentation ceremony which took place at the Cunningham Heights Spooners in Cayon, Prime Minister Dr. The HonourableTimothy Harris expressed confidence and satisfaction in the economic trajectory of the Federation of St Kitts and Nevis. “St Kitts and Nevis is showing a strong and steady pattern of economic growth. We are seeing more and more foreign direct investment interest coming in such as the new Park Hyatt, the brand’s first property in the Caribbean. This only shows that we are indeed open for business and St Kitts and Nevis is a conducive economic environment to do business. We have also received international recognition for our strides in the area of ICT where St Kitts and Nevis was the only participating country to have received two awards at the World Telecommunications/ICT Indicators Symposium held in Gaborone, Botswana, “said Prime Minister Harris. 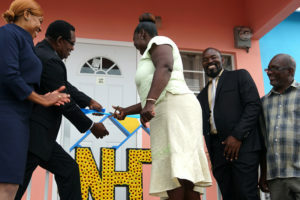 At yesterday’s event, the National Housing Corporation (NHC) also launched a newbrand campaign dubbed The New NHC: Committed to Family to reiterate its commitment to their mandate of raising standards in the housing sector. Along with this comes a mobile app complete with more information on NHC, application forms, a platform for enquiries and feedback and an intuitive user interface. The Hon. Eugene Hamilton, Minister of Human Settlements, Community Development, Land and Cooperatives said his ministry has made strides towards tangible reforms that are key to furthering the objectives outlined in the corporation’s mandate. “We are witnessing the fruits of the Team Unity Housing Solution Program and more broadly the vision of the Team Unity Government as promised in our manifesto, we have mentioned time and time again that our commitment is unwavering when it comes to the welfare of the people of St Kitts and Nevis. Ministry endevours to pursue elevated solutions that positively impact the overall quality of life for our people and these homes represent that vision and commitment to our mandate as an institution;” said Hon. Hamilton. “I want to congratulate the NHC for the launch of the mobile app. This is very progressive. As we endevour to deliver a more streamlined application process for those interested in purchasing, constructing or renting houses we take advantage of digital advancements that make it easier for members of the public to interact with government institutions and receive timely assistance towards their housing needs, “added Hon. Hamilton. Speaking at the event the Chairman of the Board of Directors at NHC, Valentine Lindsay said the corporation recognized the need to support local businesses and create more jobs for the people of St Kitts and Nevis. “We have a very solid agenda to deliver better housing facilities to the people of St Kitts and Nevis. To this end, we broke the ground for the Unity Housing Solutions Program in March this year paving the way for bigger and better homes while at the same time creating more jobs and supporting local businesses in the construction sector by using locally available materials, “said Mr. Lindsay. The Unity Housing Solutions Program is a platform forNHC to supervise the construction of 300 affordable homes throughout St. Kitts for the benefit of people with small to modest incomes. These homes have bigger bedrooms and bathrooms, and carry small monthly payments depending on household income.Under the program, houses are also constructed for people who have land but need assistance to build. The event wasstreamed live on the NHC St Kitts Facebook page and is available for viewing.